My name is Parie and I am a highlighting addict. Every brand that brings out a highlighting product, gets added to my ever growing wish list. There are so many different formula's out there and so many I love, but this one from a 'drugstore' brand has fast become my favourite. The best part is that it only £5 and is worth every penny, if you are on the hunt for a new highlighter - then you've come to the right place. This highlighting powder is from the Superdrug own brand MUA, who retail cosmetics from £1 to £10. A brand that I used to adore back in the day and what started my makeup addiction for sure. They've recently released a new Luxe range, with prices that are slightly more expensive, better quality and gorgeous packaging. 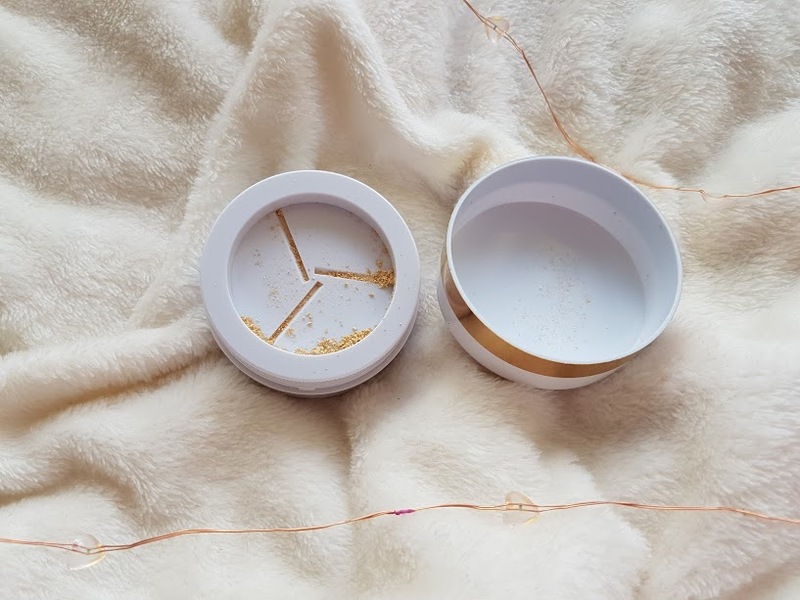 This powder comes in a white tub with gold detailing, its simple and eye catching. When you lift the lid the way the product comes out is very fancy, there are three slits which reveal the powder when you twist the tub. Personally, its a bit gimmicky - I would prefer to just be able to access the product straight away but there's nothing like experimenting. 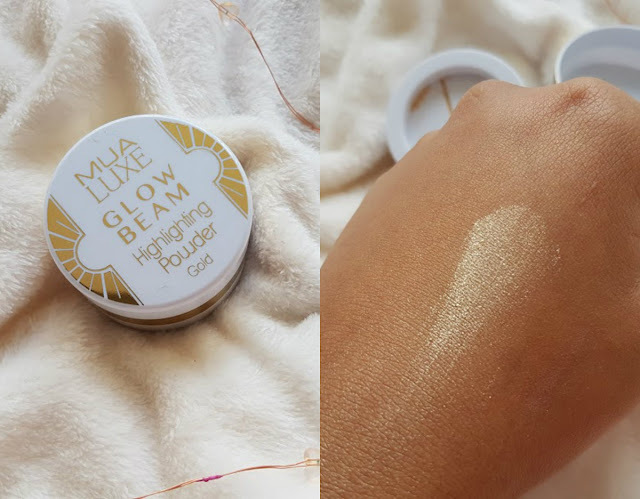 The Luxe Glow Beam retails at just £5, and is a finely milled gold powder. 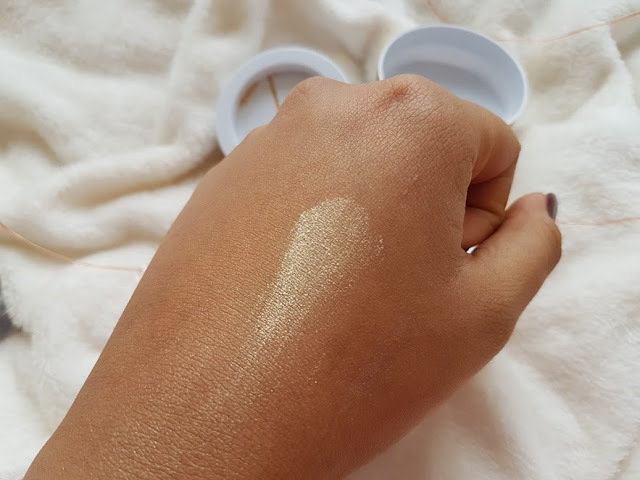 Its a true gold colour and adds the most gorgeous glow to the skin, I've been using my fingers to apply it as it works best but I need to invest in a fan brush soon to get the best effect. One tiny swipe is all I use everyday and a little more in the evening to jazz it up and the pigmentation is incredbile. It looks amazing, feels lightweight and compliments my skintone really well. I've noticed that it lasts all day long, from applying it at 7am to go to work and coming home at 6pm its still there - when the sun hits it oh my its gorgeous! I just want to apply it everywhere! If you're on the market for a new highlighter, or something sparkly for the party season then this one is for you!